Over the coming winter, once the house redecoration is complete, we have set ourselves a couple of tasks in the garden. I'm sure you wouldn't expect us to be doing nothing at this time of the year no would you!! We have the quarantine pond to finish and also we want to add irrigation. However one task that has been long over due is to make the jungle part of the garden more illuminated. With the new koi pond we added lighting to the pergola to illuminate the pond and fish, keeping it not too bright so as to not upset the neighbours. We also added lighting to the first and second raised beds, using small spot lights to pick out some of the more specimen plants. Mostly the plants highlighted are yuccas, which I guess was probably right as they are the most architectural in that border. I would like to add some light to the third raised bed and also the koi filter house, although now things are completed there I'm not sure I can hide the cables without disturbing the finish, so perhaps not. With the fire and birth of the new Jungle Hut we changed the style of the lighting, adding a pendant and two wall lights, with which we are really pleased. We would now like to add extra lighting to that bottom part of the garden, partly to illuminate the pathway and also to pick out key plants. 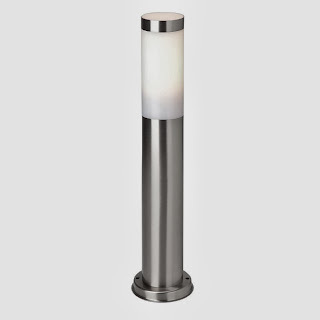 For the pathways, I would quite like to have something like this post light from Zed Lighting, keeping quite a simple look to the lighting so the lights themselves don't steal the show compared to the garden itself. We have started to introduce a few other stainless steel elements into the garden so they would tie in. Where we want to pick out particular plants we will use a similar low voltage solution to that we used in the raised beds by the pond. These were easy to install and being low voltage reduces the risks in the garden. I have seen a few gardens where they make a feature of the lighting using coloured lights to illuminate trees or other features at night, whist these can be quite impressive, I'm not sure that would work with the enclosed nature of our garden. Having just walked down the garden with a torch to take photos of the Jungle hut it makes me realise just how important new lighting along the path in that direction will be, so when the jobs in the house are all finished I'm looking forward to new projects! Garden lighting is something we've completely failed on, a touch ironic since lighting is what Andrew does for a living. It makes such a difference in how you use and enjoy the garden. I look forward to seeing how you conquer the task. I think with your gardens it will definitely make a difference in the evenings if you are out there any amount of time at all. Like what you've done already with lights. Definitely Cher, it takes on a different atmosphere in the dark with garden lighting on. I like that post light--so clean and simple looking. Nice choice. You're always adding something fabulous! I'll bet your garden looks amazing with the new lighting!